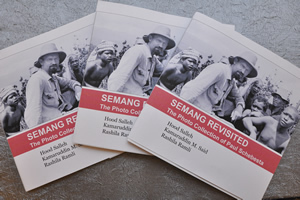 BANGI, 17 August 2012 – The National University of Malaysia (UKM) in collaboration with the government of the Czech Republic have launched a coffee-table book The Semang Revisited: The Paul Schebesta’s Collection based on research by the Czech anthropologist in the Malay Peninsular 90 years ago. 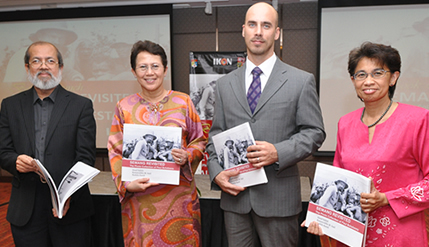 It was launched by UKM Vice-Chancellor, Prof Tan Sri Dato’ Wira Dr Sharifah Hapsah Syed Hasan Shahabudin in Kuala Lumpur at a brief ceremony last week at a buka puasa organised by the Institute of Occidental Studies (IKON). Deputy Head of the Czech Embassy, Dr Martin Hubinger represented the Ambassador, Jan Fury. Both had contributed to the publication of book by securing rights of Schebesta’s treatise from the original publisher and the Czech Archives. The book is published as a limited edition and presented to certain selected individuals and is not yet for sale. Schebesta conducted his research on a tribe of the Orang Asli, then almost unknown to Europeans except the British. Schebesta had written one of the earliest modern treatise about the Semang society of Peninsular Malaysia, Among the Forest Dwarves of Malaya in the 1920s. His work included many photographs of the Semang, which were included in the new book. Semang Revisited is co-authored by Emiritus Professor Dato’ Dr Hood Salleh, Profesor Dr Kamaruddin Mohd Said and Associate Professor Rashila Ramli. It consists mainly of photographs from Schebesta’s original work, with brief descriptions of the Czech researcher’s original notes. Emeritus Prof Dato’ Dr Hood is Principal Fellow and Director of the Academic Heritage Museum of UKM and the Institute for Environment and Development (LESTARI). He is a renowned anthropologist who has often been consulted on matters about Malaysia’s aborigines. Prof Kamaruddin is the Director of Penerbit UKM, the university’s publishing arm and is a photographic enthusiast whose works have been exhibited at home and abroad, as well as having sold some of his photographs as works of art. He is a member of the University Senate and professor of Anthropology at the Faculty of Social Sciences and Humanities. He supervised the digital restoration of Schebesta’s original photographs for the book. Assoc Prof Rashila is Director of IKON and specialises on Global Governance and Gender and Politics. She is also researching on social rights and social justice of marginalised people. Prof Hood said Schebesta authored Among the Forest Dwarves of Malaya at a time when Europeans were very interested in societies they perceived as primitive. The coffee-table book, however, is not judging or analysing Schebesta’s original work, but gives emphasis on the high quality photographs that he took, he said. Prof Hood said Schebesta was also a Catholic priest whose primary task was to proselyte the Orang Asli but eventually became more interested in learning about their culture and language than trying to convert them. Prof Kamaruddin praised Schebesta as a very competent and dedicated photographer saying that he was astounded by the quality of the negatives when he first examined them last year in preparation for an exhibition at UKM last Novermber. He said the Czech researcher must have been very meticulous in preparing to shoot the pictures, because the photographs were very sharp and the contrast range was quite broad. Assoc Prof Rashila who examined Schebesta’s Among the Forest Dwarves of Malaya, compared the book favourably with the works of other Europeans at that time. She said while many other academics were biased and hostile to societies they perceived as backward, Schebesta lived with the Semangs in the Belum district of Perak unlike other “Orientalists” who were mere arm-chair researchers who never got to know their subjects. Paul Schebesta, who died in 1967 at the age of 80, was in the peninsula in 1924 and 1925 to study the Semang community, among whom he lived in their jungle world. He worked in the areas of physical anthropology, ethnology and linguistics and did not accept other anthropologists’ theory that the Semang “pygmies” were a variant or subspecies of ancient mankind but were in fact a species of Homo Sapiens. Neither did he accept, as others did then, that slightly-built Semang were a degenerative form of humankind and defended their primary-primitive status as a category in its own right. The main contribution to pygmy ethnology made by Schebesta was to be the first to give a rich description of the culture of the pygmies of Southeast Asia and Africa. In addition to the academic side of his research, Schebesta also set out to help his small forest friends uncover the way to fit into the large picture of the development of mankind to avoid being sidelined by modern civilisation, according to a biographical note on him.